The last time we heard from Vernon Rust, Helen Bird, Trenda McMillan and Jim the mechanic, they were all living out of their cars in the Walmart parking lot at Slaughter and I-35. Rust and his partner Helen thought telling their story might take it in a new direction. Instead, things took a turn toward the familiar. Trenda McMillan lived out of her station wagon in the parking lot of an Austin Walmart with her two dogs until she was forced to leave a few weeks ago. Could it be that this little vignette on “Austin’s Real ‘People of Walmart’” parking lots actually got them kicked off the lots? Do they blame me? “We brought that trouble on us personally,” Vernon wrote. 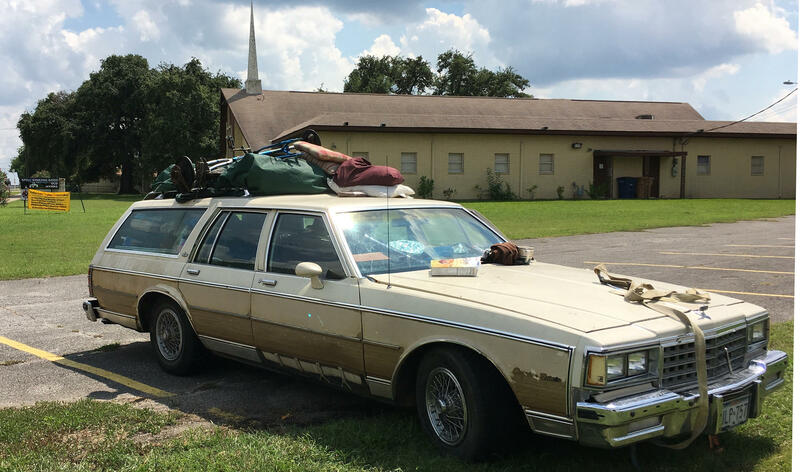 “No worries.” He added that Trenda, who was looking to fix up her 1983 Chevy Caprice station wagon, was staying at a church. 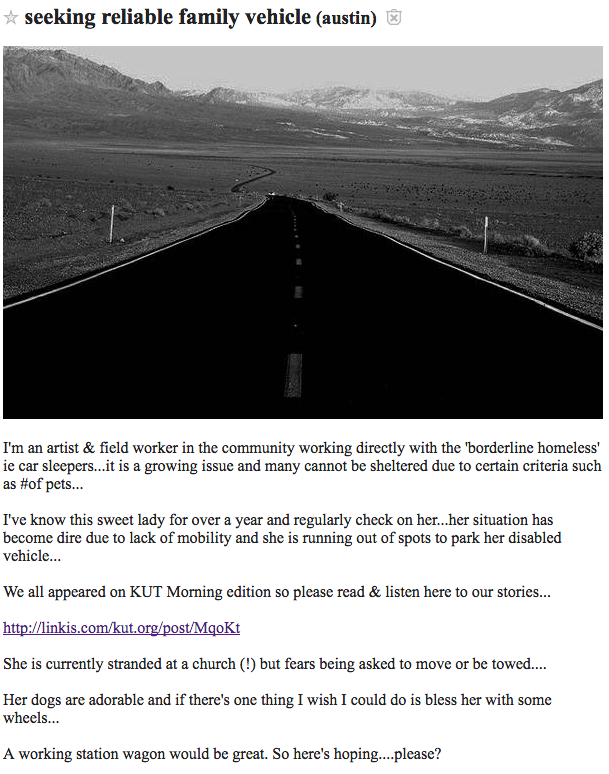 Helen, Vernon’s partner, posted this ad on Craigslist, asking for a vehicle donation. After driving by many different South Austin churches, I found Trenda and her vehicle essentially marooned at a small church on South First. Trenda says speaking with KUT didn’t necessarily lead to Jim and her getting kicked out of the parking lot. So, four of the six people mentioned in the original story and all three vehicles pictured at South Park Meadows were told to leave. The store’s general manager Donna Carmichael told me homeless people are asked to leave the property daily because of customer complaints. She hung up the phone before we could get to recording an interview. In fairness to the store, Trenda was violating its policy. Her car has since become immobile. Vernon, by his own admission, was asked not to return a year ago. Jim was cited by police for parking elsewhere on the sprawling shopping property. But, there are other cars and occupants that remain parked, more or less, in the same spot since last month’s story. Ann Howard, executive director of Austin’s Ending Community Homelessness Coalition (ECHO), says folks like Trenda and other car-campers fall into cracks in the city’s homeless aid community. 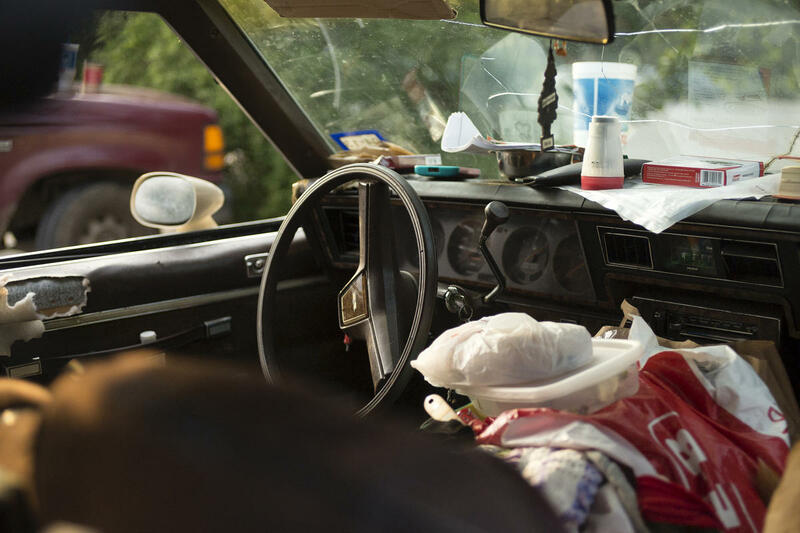 A view from the inside of Trenda’s 1983 Chevy Caprice station wagon. “Austin became aware several years ago that we lack the outreach resources to do a really good job at getting to know folks and trying to bring them in where they could access services,” she says. Officially, the Austin Police Department is looking to a new direction. This month the department began a pilot program that pairs officers patrolling downtown with advocates, with a goal of understanding why certain people are experiencing homelessness. The hope is that this more individual approach will help get more people back into homes. However, if the new programs finds traction, it’ll take time for them to make their way to folks like Trenda –the pilot program is currently confined to the downtown and West Campus areas. Trenda fears her time in the church parking lot may not last that long. She’s says she’s worried they’ll ask her to move her car any day. As of publication, she says a church member’s son is helping her fix her car when he can in his spare time, but she still needs parts and doesn’t have a lot of money. Since the group was asked to leave Walmart, Vernon, Helen and Jim still check up on Trenda when they can. Vernon and Helen have moved to other parking spots. Last month, Jim told me he was contemplating a trip home to Washington to see his mom. Trenda says their displacement has moved up his timeline. One positive note: For the first time in years, Trenda’s daughter saw a picture of her mother – her family lives in the Houston area. Her daughter also reminded Trenda what her two sisters do in Crosby, Texas; they work at Walmart. Why Haven’t Libertarians Taken Off in Texas? How Far Would You Go for an Insurance Discount?